You’d think that being retired we would have lots of time. However, we all are quite busy personally (some more than others). And then there’s our business that gets busier all the time. When we are stretched to our limits, we sometimes do crazy things. For instance, forgetting to add fragrance to a batch of soap. 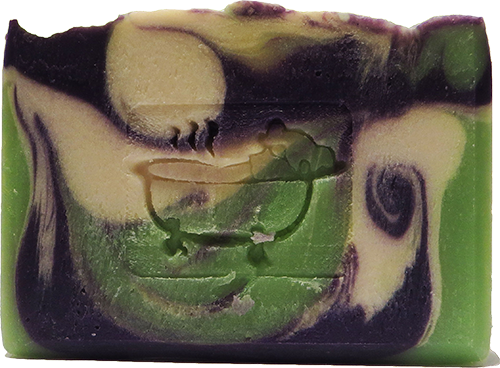 That batch became unscented instead of Lily of the Valley! I wish I could say that was the “only thing” we’ve forgotten! After cutting and stamping soap, the stamps are always washed and laid on paper towels to dry. The last time we went to stamp soap, 3 of our most used stamps were missing. They are always in the same place every time and they just weren’t there. We tore our stuff apart trying to find them! We think that in our rush to pick up and get to some other obligation, one of us threw them away! No worries….our newly ordered ones have arrived! Then there was our first show! Susan couldn’t go so it was Cindy & I in Wilmington.MA. We actually thought we were doing quite well just the 2 of us. It took Cindy awhile but she set up the rack for the backdrop by herself. It was the first time we were using it and it looked great! We got back to town & guess what?!?!? In our hurry to pack up and head home, somehow we lost a few screws and a pole that went to the rack! Yes, our new rack has arrived and we’re using it & VERY carefully putting all the parts in the bag when we’re done! Another rack story…Susan’s job is to set up the rack with the shower curtains. We were at the Whoopie Pie Festival and she was setting it up, She got a phone call and after she got off the phone, the screw she needed and had in her hand disappeared!! Now how does that happen? We looked everywhere and no screw! We had a very tippy backdrop for the rest of the day. Thanks to Jay, Susan’s husband, we have 6 new screws!! I saved the best for last. Susan is very talented at writing the descriptions on the web site for all of our soaps. She’s busy too and she always asks us to edit them and we do. Cindy & I were at the Boothbay Harbor craft fair and had some down time so we decided to edit the newest descriptions together. Susan had written a description for Lime soap. She meant to say “the mouth puckers” but instead wrote “the mother puckers”!!! And this was a live post! After keeling over in laughter, we immediately made the change! Time….there’s just never enough of it!